There used to be a programme on TV called 'This Is Your Life', hosted by a genial Irishman called Eamonn Andrews. His job was to surprise celebrities as they went about their fabulous days, doing fabulous things, and present them with a big, red photo album. "Famous celebrity," he'd intone, with a twinkle in his jovial Irish eyes, "This is your life!" And the celebrity would coo and squeak and wave hands about, all a-flutter. Me? Me?? Really? I am not worthy - well, all right. If you insist. "Father O'Shea, Tom Celebrity was instrumental in the airlifting of urgently-needed medication for ailing babies in the Congo, is that not right?" "Indeed it is! We were desperate, so we were, but Tom Celebrity here just loaned us his private jet so we could fly in 20 tonnes of antibiotics for Congolese children. The man is a saint!" Celebrity does his best to look modest: Aw, shucks. It was nothing. It was for the kids, man. Good grief, where am I going with this? Oh, yes: today's question - where are your finished objects now? Finished projects: this is your life! Sadly, I don't really know where more of them are. No idea. Or, at best, a vague idea. See, I like making stuff. But my finished objects need to find homes or we'd disappear under an avalanche of hats, scarves, afghans and baby blankets. I wrap them carefully and nicely in cellophane, with the vague idea of selling them on Etsy or Artfire - where I'd comandeer designer prices and would be able to give up my day job to sit at home and crochet. Then some Good Cause comes along and, filled with guilt because I have the means to sit at home crocheting and watching sitcom reruns while there are people out there - scarfless and mittenless and maybe even blanketless - I give them all away. It's for the kids, man, I say, in my best celebrity voice. I'm doing it for charidee! That might make me sound altruistic, but it's also kind of practical: I need space. However, there's something kind of vaguely exciting about sending stuff randomly out into the world, without knowing who'll get it or where it'll end up. It's like a message in a bottle, really. An injection of good karma into the cosmos. Yeah, man! 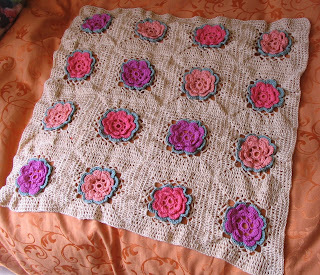 This, and half a dozen other baby blankets, ended up in the US about three or four years ago. A woman on another forum posted about her local hospital in Denver, Colorado, where babies from low-income families were being sent home in towels and torn-up old bedsheets because neither the families or the hospital could afford to provide proper blankets for the babies. It struck me as particularly sad to think of a newborn being sent home wrapped in a threadbare hospital sheet. Goodness knows, life had already dealt them a pretty rubbish hand, but starting it off in hospital cast-offs seemed somehow terribly unfair. 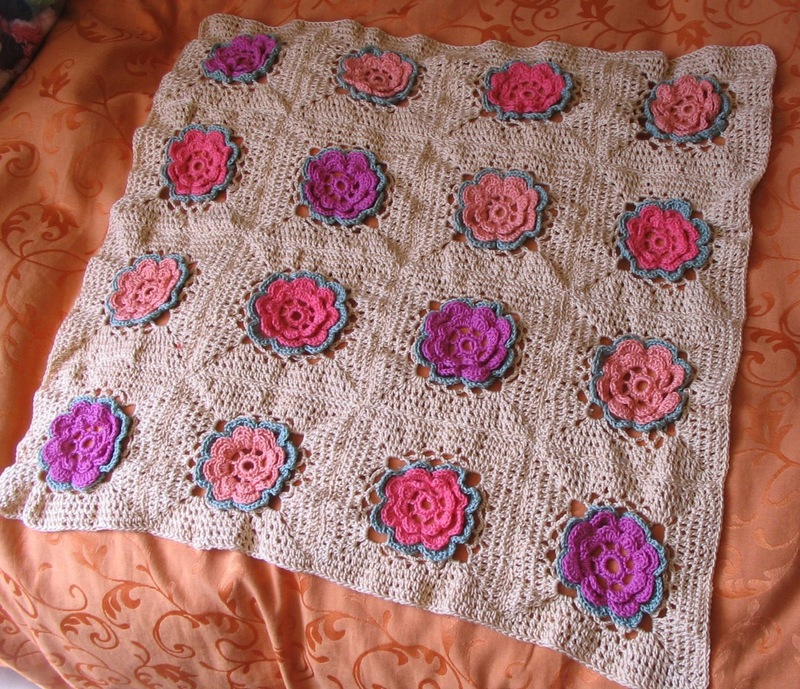 At the time, I'd been experimenting with Irish crochet motifs and I had these three odd colours: coral, deep peach and raspberry. Although they were individually quite nice, I simply couldn't match them to anything else, so they ended up in a blanket of their own. God knows where it is now. Being realistic, the chances are quite high that it was tossed or disregarded or ended up in a thrift store or bin. But there's a teeny-tiny chance that the person who got it appreciated it. Liked it. Maybe even loved it. 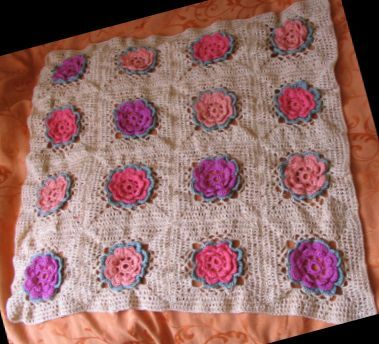 Perhaps there's a three or four-year-old out in the world somewhere who owns this blanket and fingers the flowers and counts the petals, the way I used to do on my sister's crocheted flower blanket. That would be nice.